Maybe I am on a short fuse with Aion, but I can’t help it. I ended up downloading and reinstalling the client. I had been playing the game perhaps for two month after the game went live. If a AAA title goes free to play, it certainly deserves a chance to get revisited. Besides, the beauty of free to play is the fact that you can live and die by your whims. One death to many on Everquest or Vanguard, lets see what’s going on elsewhere. Feed your ADD. Not so fast. NCsoft games are often under hacking attacks and the security the company has build up is unusual and annoying. 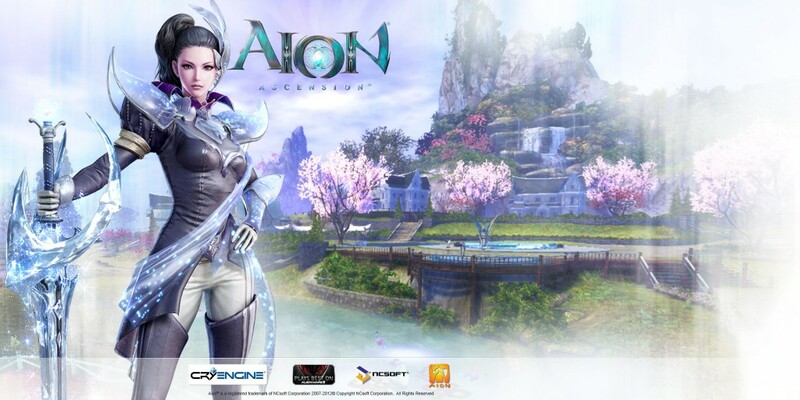 You’ll end up with a password for your NCsoft account, for your AION acount within NCsoft and with a PIN you’ve defined for yourself. The pin is entered on a popup numerical keyboard, which gets scrambled with every login. I finally managed to login and see my characters. At least their heads and their legs. The midsection is a shadow behind some ghost image of waterfalls. The screen is in a similar bad shape after I log into one of my characters. The waterfall is still there. I played around with some of the graphics settings but no luck. The forums don’t yield much in that direction, a few mentions of similar problems, but no solutions. In the meantime, the first “Kinah” / gold sellers start spamming. That hasn’t changed since the game started. And that does it for me for now. See you again in four weeks or so, Aion. At least I got the fansite kit downloaded and get to put a pretty picture into this post. AION game content and materials are trademarks and copyrights of NCsoft Corporation and its Licensors and used with permission. All rights reserved.